As you can see, it was available in both the traditional plum stain we’ve also come to associate with another Rogers line, the Shamrock, but the Killarney also came in a higher, natural grade. What’s fascinating to me is the stinger. I couldn’t draw through the air hole at all, so clogged had it become with tars. 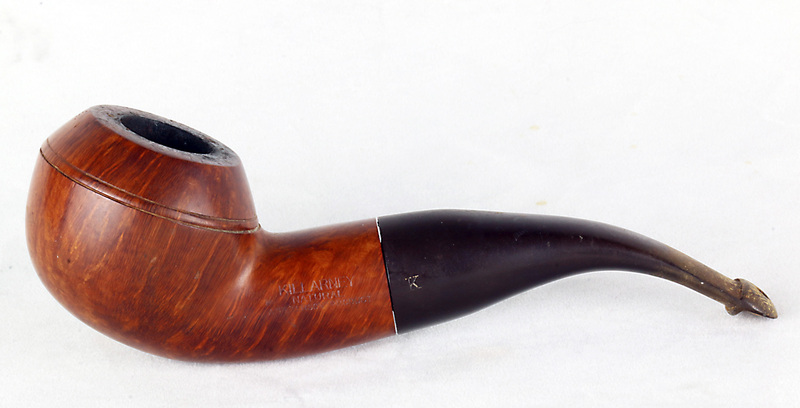 When the pipe was on the work bench, my thought was to carefully clean and remove it, then restore it and give it a smoke and experience what it was like to smoke this pipe 70 years ago. I let just the stinger soak in ice water for a spell, hoping that would contract it and make it easier to remove, but had no luck. I thought I was gently turning it with the jeweler’s liars and it just snapped in two. So much for reliving the past! Also note the “K” stamp. 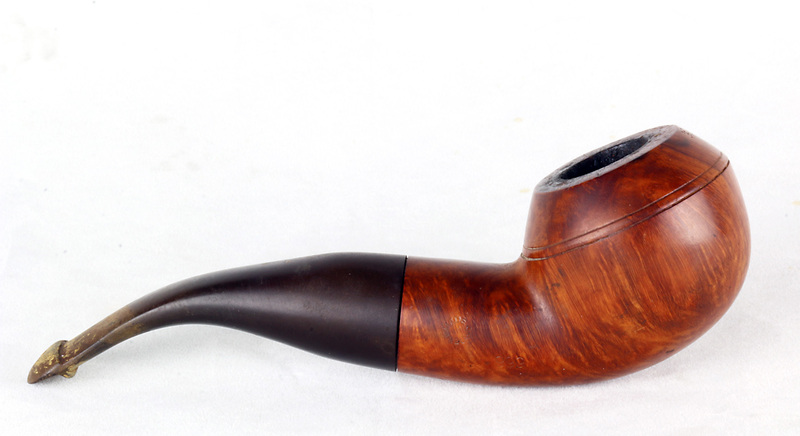 Apart from the oxidized mouthpiece and a bit of scuffing on the rim and light carbon in the bowl, this was an amazingly clean pipe. The stamps on both sides of the shank are among the sharpest I’ve seen in any Peterson. 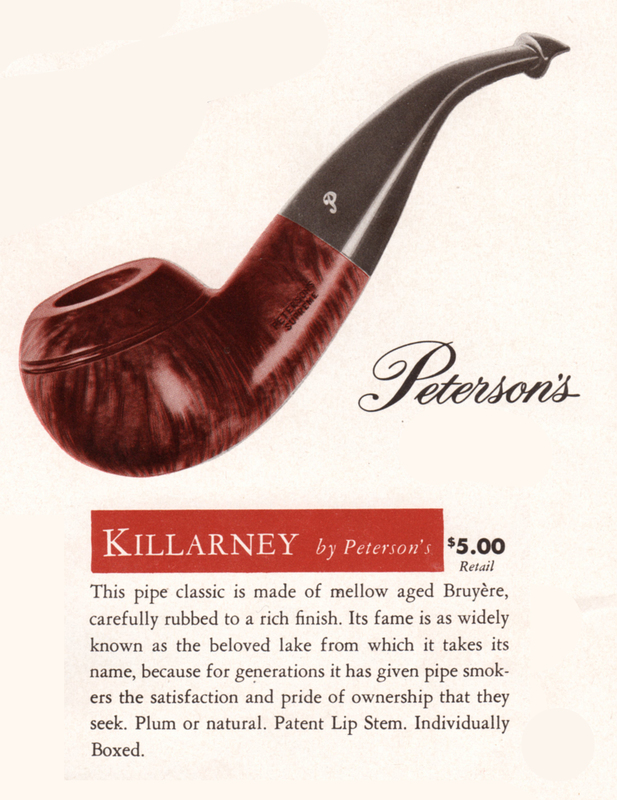 The MADE IN IRELAND in a circle is indicative both of its being a Rogers Imports pipe (the shape isn’t found in the Canadian GT&C catalog) and being of a better grade. There are a few tiny fills, notably one on the bowl rim, but I think what qualified this bowl for the Killarney Natural line was the fantastic grain. 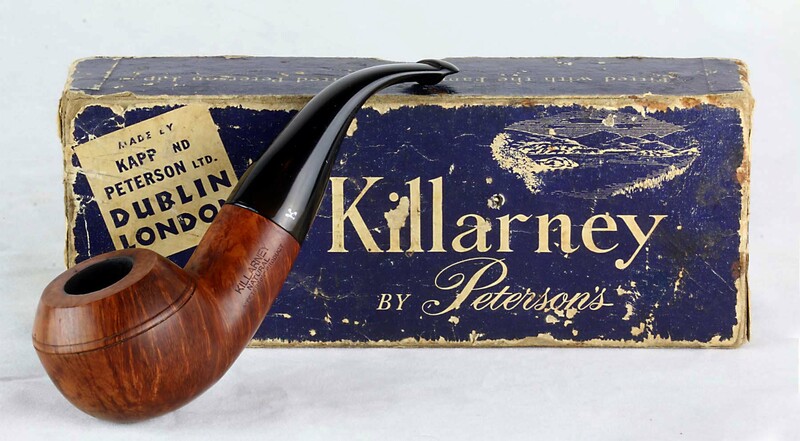 The Killarney Natural line last appeared in the 1957 Rogers Imports catalog, which makes dating this piece a cinch—it had to appear not much before 1953 and not much later than 1957. There wasn’t much to the restoration that you haven’t already seen and read about here or on other sites dozens of times. I’m a recent convert to the joys and beauties of natural (un)finished pipes, so while I sanded the bowl with pads from 400 to 12,000 grit, I didn’t follow with carnauba, but with a very, very light coat of olive oil, which I laid on gently with my fingers and rubbed off with a micromesh towel immediately, leaving a soft, smooth matte finish. I would like to know from other restorationists how you preserve the vulcanite stamping while simultaneously removing oxidation–in other words, how do you keep from sanding it off? And how do you apply a new coat of paint to the letter—in this case, the K. Mine came out pretty well if you look closely at the photo at the very top of the post, but there’s got to be a better method than toothpick, acrylic paint and tissue. used Latin to say it. Good morning, just out of bed, Singleton in a Mycroft, coffee and fine reading. I’m just acquiring a taste for burleys, Jorgen, working on HH Burley Flake and Solani ABF tins. Sounds like a good morning! I’m ready for a cuppa, myself. Interesting and informative. Stingers are a bit of a puzzle with me. I have removed them from pipes if I have been able. However, an old BBB pipe I have has the remains of a stinger base still stuck there, without in any way affecting performance. I didn’t realize that Peterson used stingers, so a small revelation here. Lovely shape. As to colour, the natural would be my choice. Thank you, Mark. Top stuff as usual. I guess it was part of the smoker’s zeitgeist in the 50s. 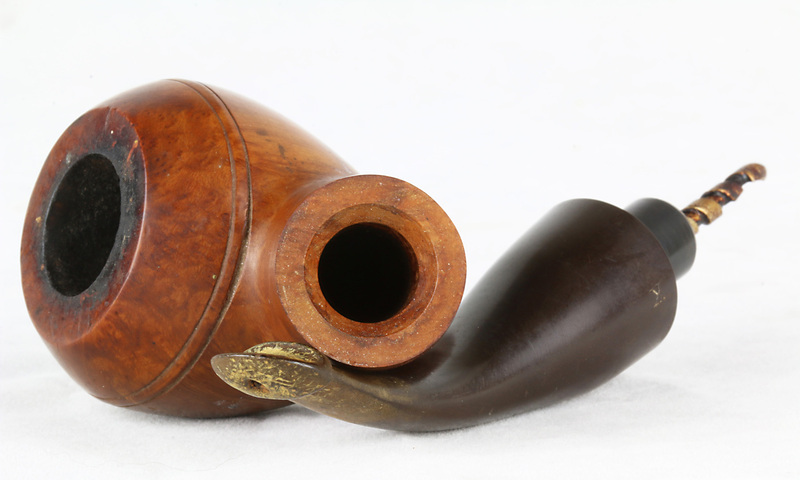 Peterson actually released a “twin bore” mouthpiece on some of their Iwan Reis lines in the 70s–again bowing to the fashion of the day. I use 4:1 bleach/water soak for 40 minutes. Then a Tripoli buff to remove loose oxidation. I use a grout whitener pen for the K.
Grout whitener pen! Genius. Thanks. Like Mark, I love the old John Bull shaped 999 Pete and to top it off this one is a natural finish! Thanks for sharing this Mark. First off if I offend anyone by what I am about to say it is not intended. Do not expose Vulcanite/Ebonite/Cumberland/Hard Rubber or any rubber to chlorine bleach or any chlorine compounds. It is a common practice but chlorine is one of the worst chemicals that you can expose rubber to, this has been known and proven through out the rubber industry for over a century. It may work but it does damage and it can’t be denied or undone. Oxygenated bleach isn’t as bad but it to causes harm. Do some research into rubber and you will find I am correct. Also the metal parts on stems, stingers, logos etc are easily damaged/destroyed by chlorine. 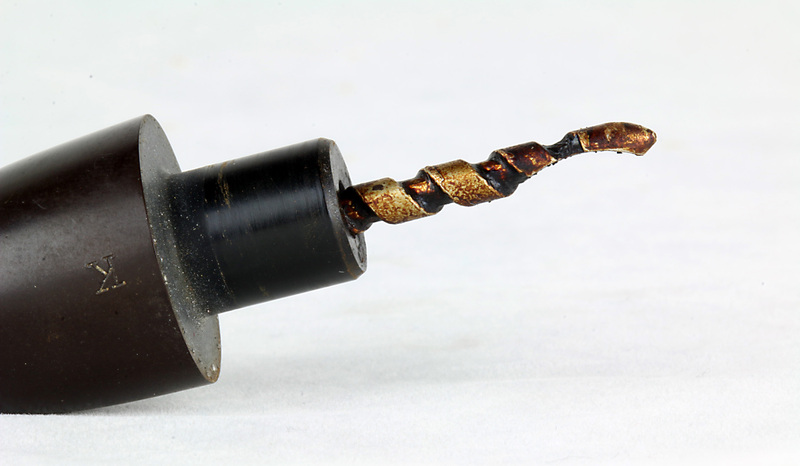 So far the best, easiest way to remove the oxidation and the safest for the vulcanite and attached metal bit and the person doing the work is the deoxidizer product made by Mark Hoover at http://www.lbepen.com Mark is well known for restoring pens and they are made of the same things our pipe stems are made from and he has developed this product over the years to do restoration work for which he is well known and respected. This and his other products I highly recommend as all who try them will. They are all made to be as gentle and safe as possible and help preserve our precious pipes I receive nothing from this other than knowing that maybe I have saved a few stems from destruction. Thanks, David. I know Steve Laug uses this product, and I know everyone appreciates your advice. I think what’s stopped me in the past has just been the expense and how many uses one can get from the product. Could you tell me if the product actually returns the vulcanite to obsidian black? Most of us use bleach, followed by extensive sanding to remove both the bleach bubbles and the oxidation that has worked in the stem, but if there’s a safer, better way to actually achieve true black, I know we’re all for it! Well as far as expense and how much you can get from that purchase. I recommend anyone to speak with Mark as he knows how to make his product work the best and last the longest. From my own use of it I would say you should be able to get from 20-25 clean stems from one bottle of de-oxidizer if used with care so stem for stem not a huge sum. Results vary to degree as to how bad the oxidation is and the grade of the vulcanite, some just to oxidize more and deeper. I did four stems at once, three came out black after one treatment, the other needed a second longer treatment. All ended up satin black. None needed extensive sanding as the bleach actually pits the vulcanite and also causes micro fissures that actually encourage further oxidation by allowing oxygen to penetrate deeper and it is oxygen that causes the oxidation in the first place. The oxidation actually rubs off with a rag after a treatment. The oxidation itself does dull the surface and if you want a high shine after you still will need to polish or sand/polish but the amount required is very much less. The whole drive behind Mark’s products is to preserve and they do as less polishing means removing less rubber. As i said it is also much safer on metal inlays etc. My GBD stem went in very brown and came out satiny black with the GBD emblem in its original condition. He has other products that I have limited use with so far but all seem to work well and are safe. If you look at the delicate patterns on many vulcanite pens you can see why he developed the de-oxidizer as to try and use anything like bleach and then having to sand would totally destroy the delicate chasing. Thanks, Dave. I’m going to give it a go on payday. I’ve recently tried the Before and After oxidation gel and was really impressed with it. I’ve used it on 10-12 stems ranging from mild-medium to heavy/gross. Two of the worst required a second soak and still some light sanding but nothing like without the product. I have also been using Rub N Buff Antique White Wax recently on stem logos and am really happy with that. It’s muh better than the mess of acrylic paint IMHO. I ordered it from Amazon but Hobby Lobby also carries it; my local store didn’t have the white. Thanks Greg. Going to put that in my Amazon wish list. Hope they have gold as well, the other color Peterson has used in the past, although a bit of silver for the recent hot foil stamps might improve a few of my restorations as well. You’re very welcome. They do have gold, silver, ebony, and several other colors. I’ve used the ebony a few times to enhance stamping on the pipes; that has been about 50/50 successful. The silver does, indeed, look nice on the stems where it is appropriate. Good is one I’ve yet to try. Mark, thats a fine 999 specimen! For oxidation, I soak my stems in a very mild solution of Oxy-clean (powder in water). Around stem stampings,someone told me about the Magic Eraser product. I was skeptical, but found it removes most of the oxidation around a stamp, but doesn’t degrade the stamping. I’ve not had much success in re-painting a stamped logo, but have not tried a grout pen. We’re off to Lowes this morning, I’ll pick one up. Did you get the stinger removed? If not, I’ve had success in hand-drilling them out with progressively larger drill bits in an hand-arbor. I’d cut the stinger flush, then get a small bit and start working it out. The soft aluminum turns out with surprisingly little effort and you’ll see it cork-screw out of the tenon. Love those old John Bulls. Your natural looks like my Dublin and London John Bull, though with better grain. For being a D&L, mine has surprisingly little grain. 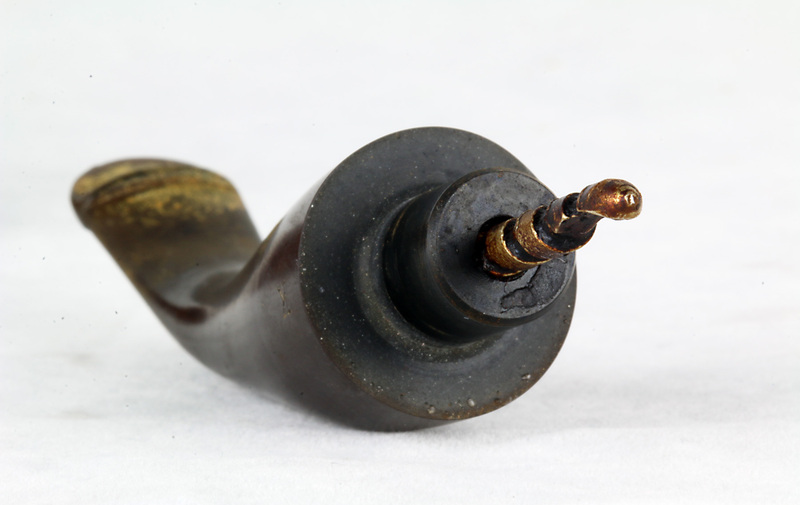 In order to sand the mouthpiece without blasting the marks you can preserve them by “painting” them with transparent nail lack, then sanding and finally removing the lack with acetone once you finished sanding. Hope be helpful for you. Regards. Thank you, sir! I’ll give it a try on my next restoration. Thanks, Xarls! I’ll give this a try on my next pipe. Very nice post and spectacular pipe! 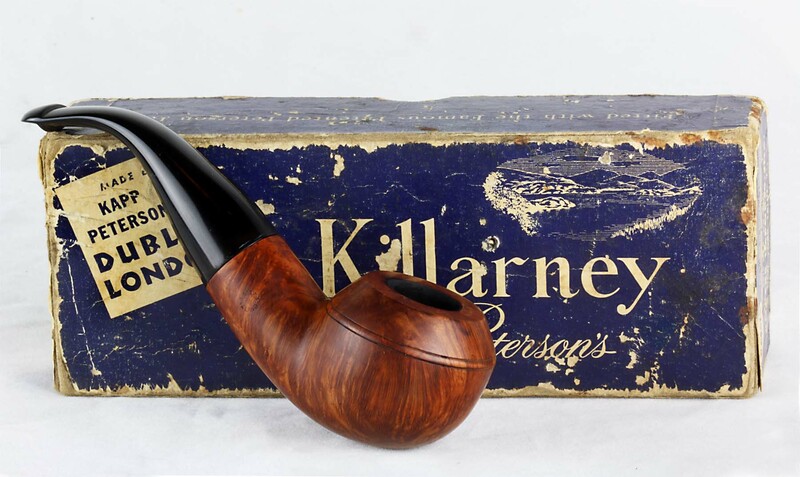 I recently purchased a London Made Killarney Natural Apple (shape 132) with original box, sock, and insert and was blown away by the quality of the briar, fitting, and finish. It sports a fishtail bit which is my preference. If I could post a picture of it here I would. Anyway, I enjoy your blog and please keep it coming. Thanks, John! I’ve got a “Gallery” page in the works that I hope to launch in January. I hope you’ll check back and post it there when the page goes up.